The U.S., seeking its seventh straight trip to soccer's showcase, lost its final-round opener for the first time since 1989 in Costa Rica. 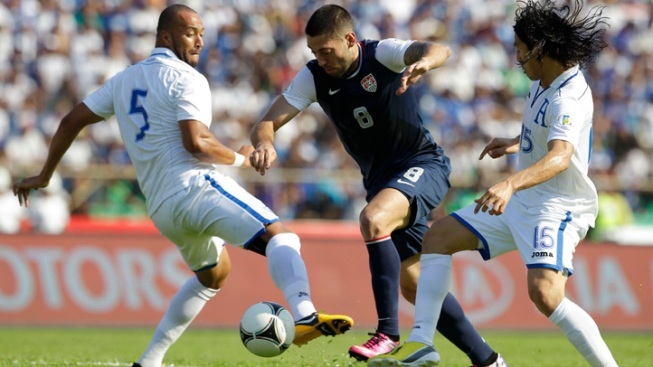 U.S. Clint Dempsey, center, fights for the ball against Honduras' players Victor Bernardez, left, and Roger Espinoza, right, during a 2014 World Cup qualifying soccer game in San Pedro Sula, Honduras. A young American defense came apart on a hot, tropical afternoon, and the United States opened the final round of World Cup qualifying with a loss for the first time in 24 years. Jerry Bengtson took advantage of a defensive mix-up to score the go-ahead goal in the 79th minute, and Honduras rallied to beat the United States 2-1 at San Pedro Sula. "They were a much better team than us today. We did look flat," American goalkeeper Tim Howard said. Clint Dempsey put the U.S. ahead in the 36th minute with an impressive volley, but the Americans gave up the lead when Juan Carlos Garcia scored with a bicycle kick in the 40th that should make the highlights reels of the best goals of 2013. Bengtson, who plays for Major League Soccer's New England Revolution, scored the winner when defender Geoff Cameron and Howard both went for a pass by Maynor Figueroa to Oscar Boniek Garcia. That allowed Garcia to tap the ball across to Bengtson for a shot into an open net, and Omar Gonzalez was too late to challenge him. "It was definitely a dagger. I didn't see that coming," said Gonzalez, who started in place of longtime captain Carlos Bocanegra. "I didn't see the guy on the back post. Maybe I should have looked over my shoulder and saw him quicker." The game marked a generational change for the U.S. defense, with right back Timmy Chandler (age 22) making his competitive debut and ending his eligibility to play for Germany. Gonzalez (24) and Cameron (27) paired together in central defense for the first time, and Fabian Johnson (25) was at left back. "Overall, there were too many mistakes done and too many players today just didn't reach their usual potential," U.S. coach Jurgen Klinsmann said. "They stayed behind their own game and therefore, it's really difficult coming away with a win here if you're not having everybody 100 percent at their limits." Playing without Landon Donovan, a veteran of three World Cups who is unsure whether to continue his career, the 28th-ranked U.S. was under pressure for much of the match. No. 59 Honduras had the better chances, forcing Howard into several difficult saves. "Not the way we wanted to start, but look, it's a long road," American midfielder Michael Bradley said. "Nobody on our end expects to go 10-0-0. That's the reality. There's six good teams. There's tough stadiums to play in, there's tough atmospheres." The U.S., seeking its seventh straight trip to soccer's showcase, lost its final-round opener for the first time since 1989 in Costa Rica. The Americans had been 12-3-3 against Honduras, including 3-0 in qualifiers at San Pedro Sula. The U.S. overcame that last opening loss to earn a spot in the 1990 World Cup, the Americans' first appearance since 1950. "Most of these guys are playing in Europe, and you come in here today at it's, like, 90 degrees, the game's at 3 o'clock," said Dempsey, who went the distance Sunday in London for Tottenham. "It's a difficult game because you can't press and run and have the endurance that you would have in other games." Klinsmann used his three substitutes in the early part of the second half, inserting Maurice Edu, Sacha Kljestan and Zusi for Danny Williams, Eddie Johnson and Jermaine Jones. "We had problems closing down the passing lanes, also on the outsides throughout the whole first half and also in the second half," Klinsmann said. "I think with Maurice Edu, things kind of calmed down a bit. He cleaned more up. He played simple balls. We kept more possession. That's what we were asking for." The U.S. went ahead when Jozy Altidore played the ball to Jones, who flicked the ball over the defense. In full stride, Dempsey volleyed the ball with his right foot past goalkeeper Noel Valladares from 8 yards. With his 31st goal in 92 appearances, Dempsey moved past Brian McBride into sole possession of third place on the U.S. career scoring list. Dempsey has six of the Americans' 12 goals in qualifying for 2014. But for the fourth straight road qualifier, the U.S. scored first only to give up the lead — on a play strung together by three defenders. "It's a great goal. Nine times out of 10 it goes up in the stands," Howard said. "From there on, I don't think we played nearly as well as we could have. And I think we got outplayed in a lot of facets of the game." The general rule in qualifying is to win home games and pick up points on the road. The top three nations in the six-team group represent North and Central America and the Caribbean at next year's tournament in Brazil, and the No. 4 country advances to a playoff for another berth, likely against New Zealand. Qualifying resumes when the U.S. hosts Costa Rica on March 22 at Commerce City, Colo., then plays four days later at Mexico. The Americans play at Jamaica on June 7. "You never want to start with zero. but you can't panic. There's nine more games to go," Bradley said. "At this point the three points in the next game are crucial."